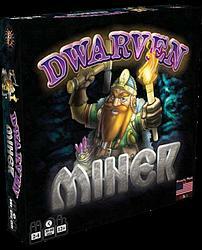 Dwarven Miner is a duel-level crafting game full of mining fun and surprises. Roll six custom dice in a push-your-luck style to see what you can pull out of your mine. Craft those resources into all types of gear, from armor to spellbooks to mithril swords. Use these items to fulfill the orders of your Patrons, great and powerful Dwarves who have entrusted you to outfit them for their adventurous occupations, be they Warriors, Rune-Singers, or Engineers. From the lowly Tale Smith to the mighty Chieftain, each will give you a special ability that affects the game and ensures that players will want to mine again and again.Made of high quality components, Dwarven Miner is made here in the USA from sustainably forested materials and soy-based inks.